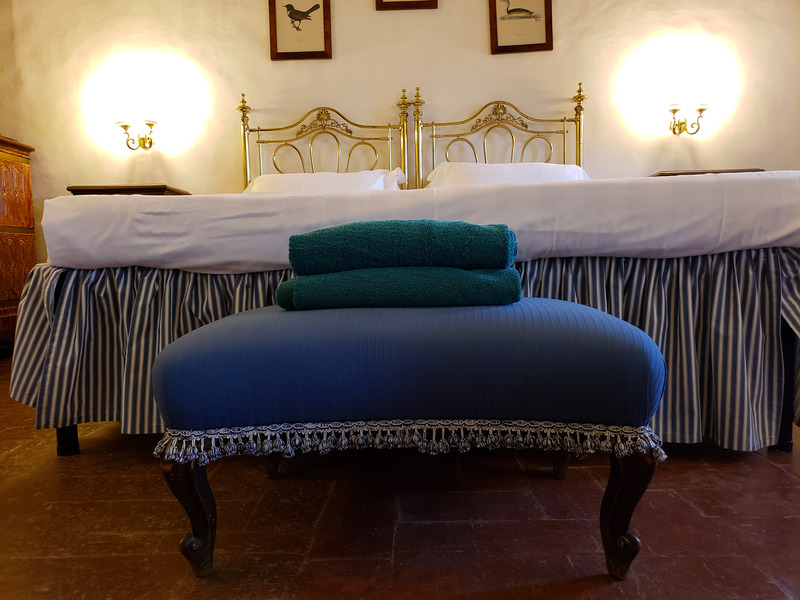 What is agriturismo? Did I binge watch Downton Abbey? These questions might or might not be answered as you read this post 🙂 Or you can just look through the photos. Either way, thanks for being here! 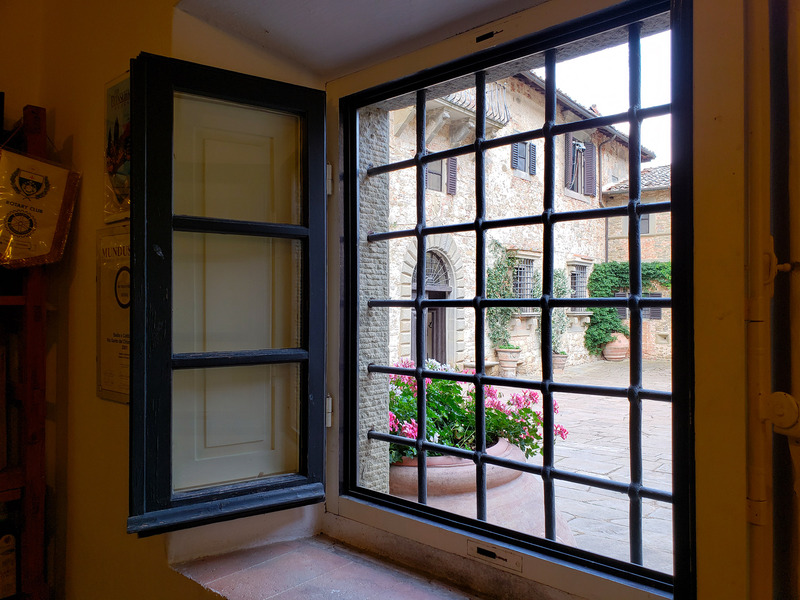 While researching ideas for our Tuscany trip I asked a friend (amazing chef Aurelio Barattini) if he would recommend a few historic places that would be a must on this visit. 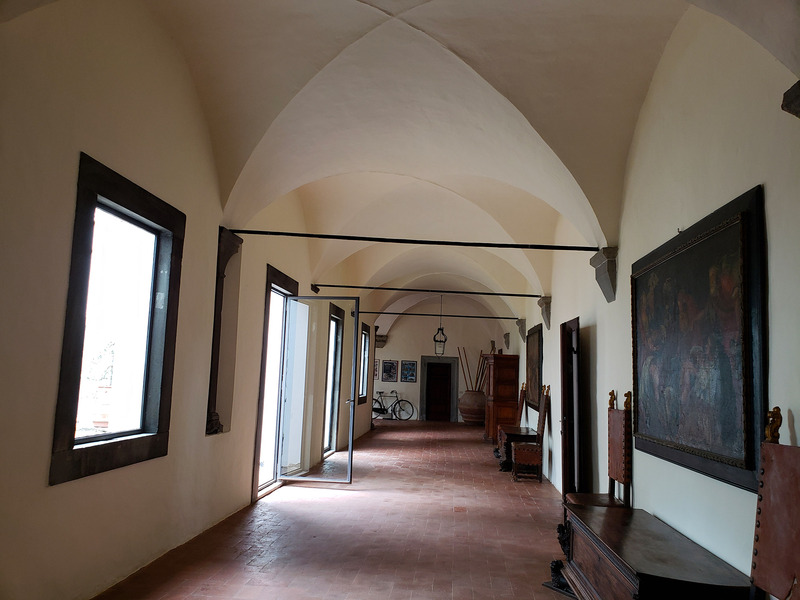 He immediately suggested Badia a Coltibuono (https://www.coltibuono.com), a thousand year old abbey/vineyard/farm which is now also an agriturismo. What does this word mean, you ask? 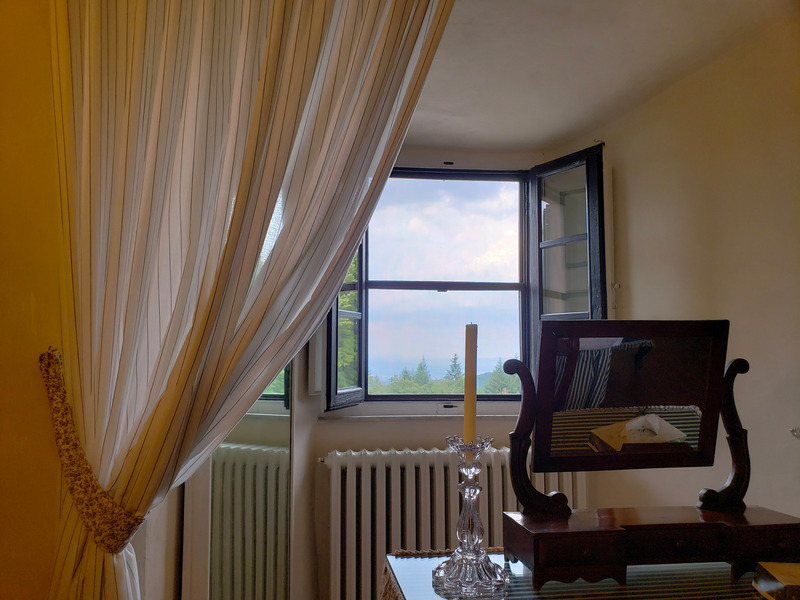 Agriturismo is a very common Italian term (which combines words “agriculture” and “tourism”) used to describe a farm which is also designed to receive guests (for food or stay, or both). 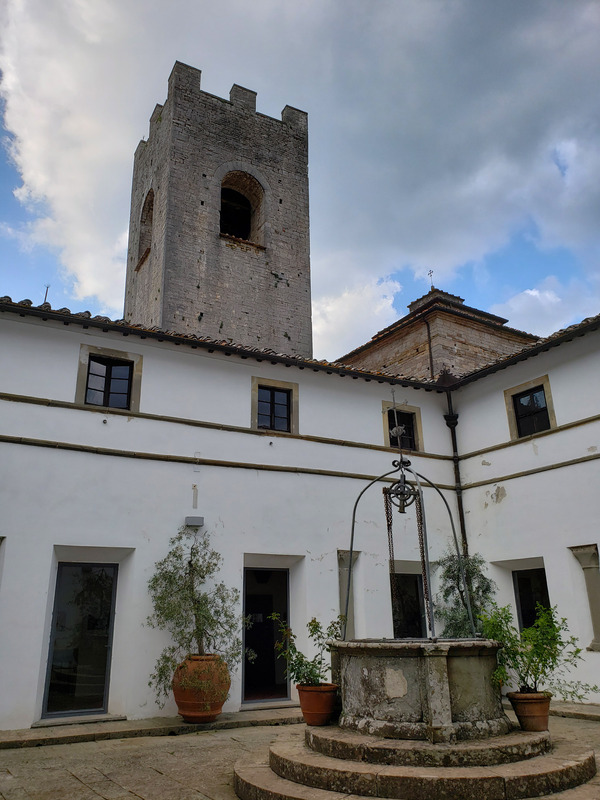 Looking at Badia’s website I had hard time processing that it was actually possible to stay at such a place (usually, a thousand year old anything would be a museum, right?). But it was possible and being there in person was even more special than I thought it would be. 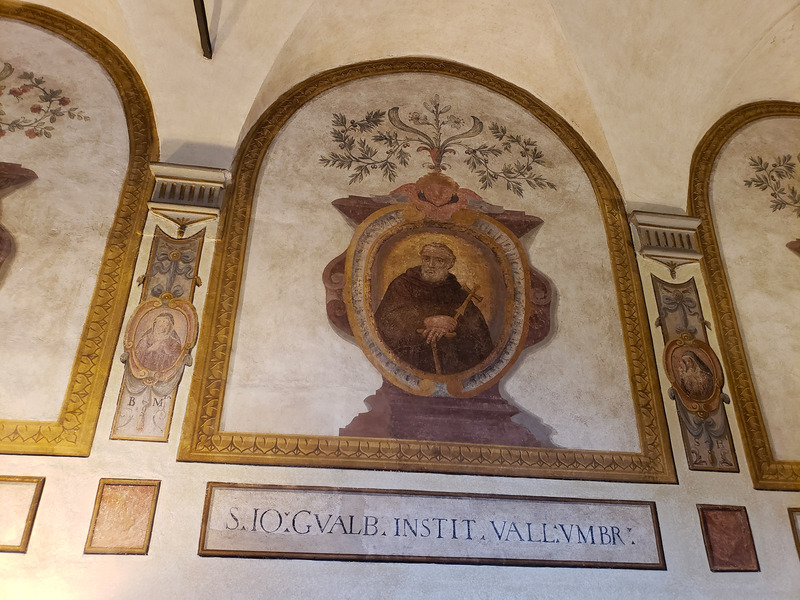 Oh, and by the way: “badia” means “abbey” in Italian. Coltibuono is the name. 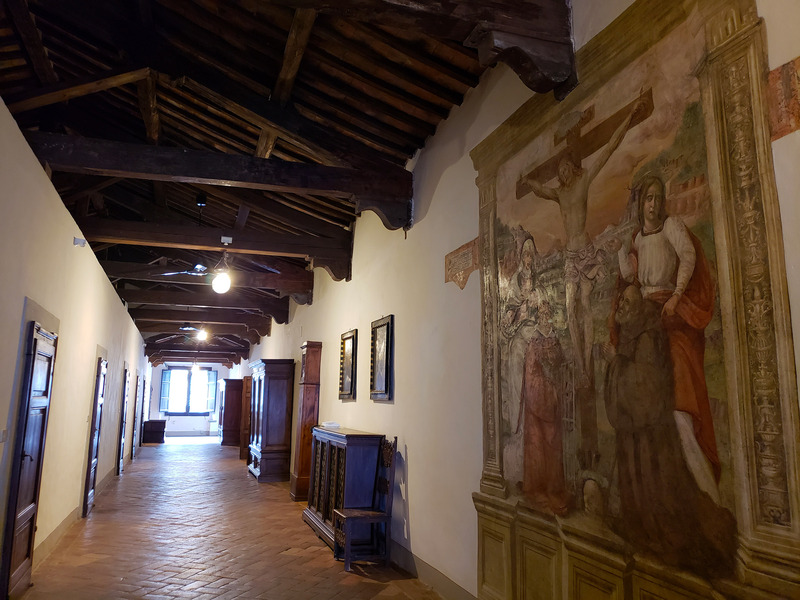 Like Downton Abbey, but in this case it’s Coltibuono Abbey! 🙂 And yes, Nick and I did binge watch Downton Abbey last year. It was amazing and we spoke with a frighteningly bad English accent at home for weeks 🙂 Anyway……. back to Italy! Anyway, we couldn’t believe this was going to be our home for the next 24 hours! 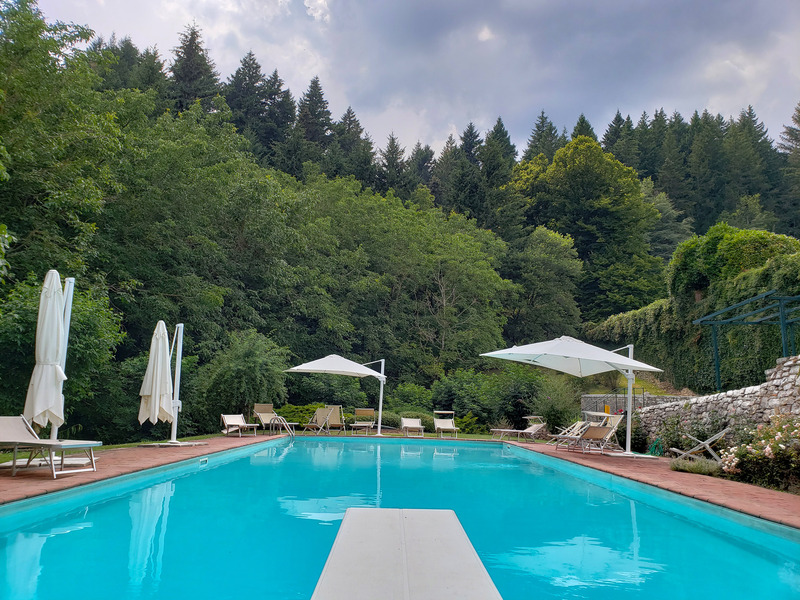 Sprawling over a spectacular hillside of the Monti del Chianti, the Badia property includes lavish gardens, a farm, wine cellars, cooking class facility and a restaurant. And the abbey itself, of course. Over the centuries the abbey has witnessed a lot of history. 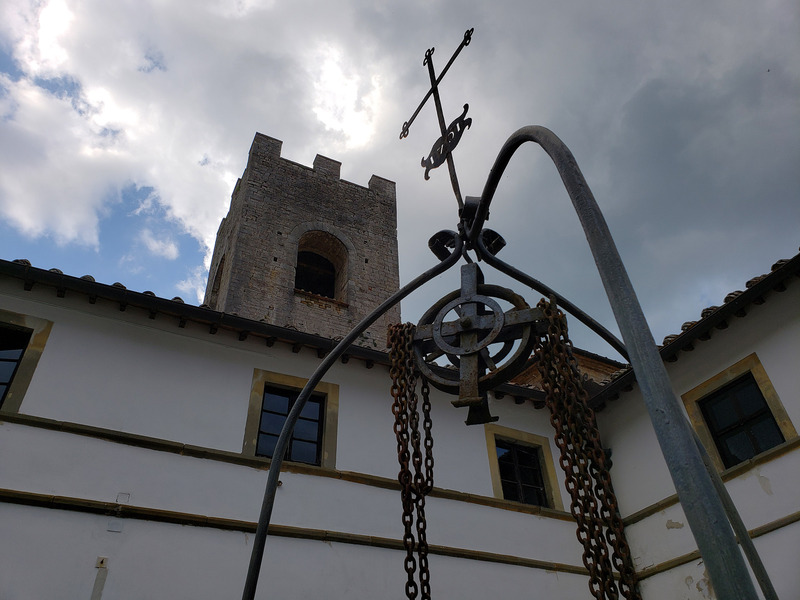 Founded and run by the Vallombrosan monks for most of its existence, in 1810 Badia became occupied by Napoleon’s troops. Decades later the abbey was purchased by a family who restored the buildings and the grounds. 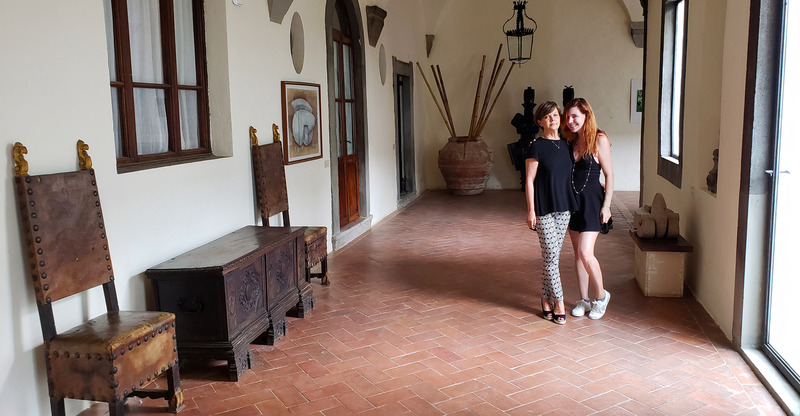 They re-planted the vineyards in the 1960s and in 1980 Lorenza di Medici (yes, from THAT family) started the B&B. 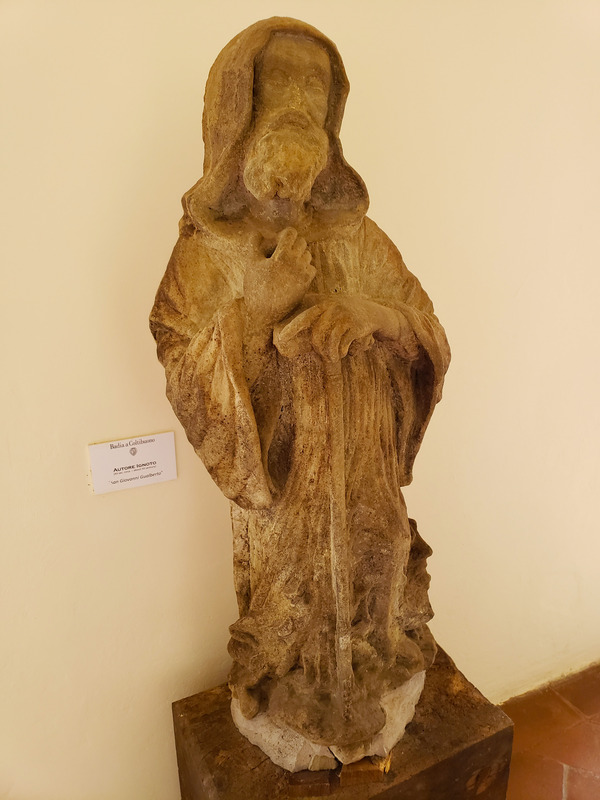 While there were other overnight guests at the abbey, we didn’t see a soul until morning (and were surprised to see about 30 people at our breakfast buffet). 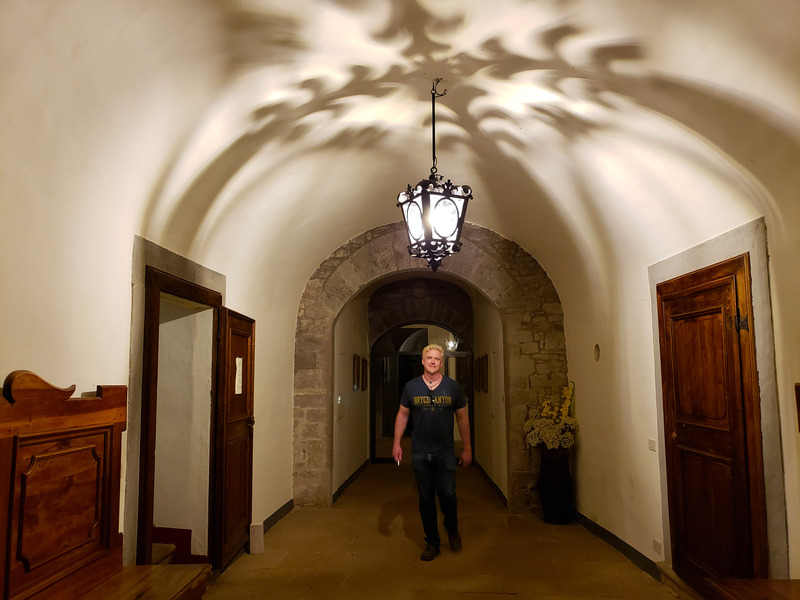 For most of the evening, Nick & I had the whole place pretty much to ourselves, walked the grounds and explored the gardens, and got some work done in the lounge area (where the WiFi signal was the strongest). Click on the first photo and then click “next”. I put captions under almost every photo. 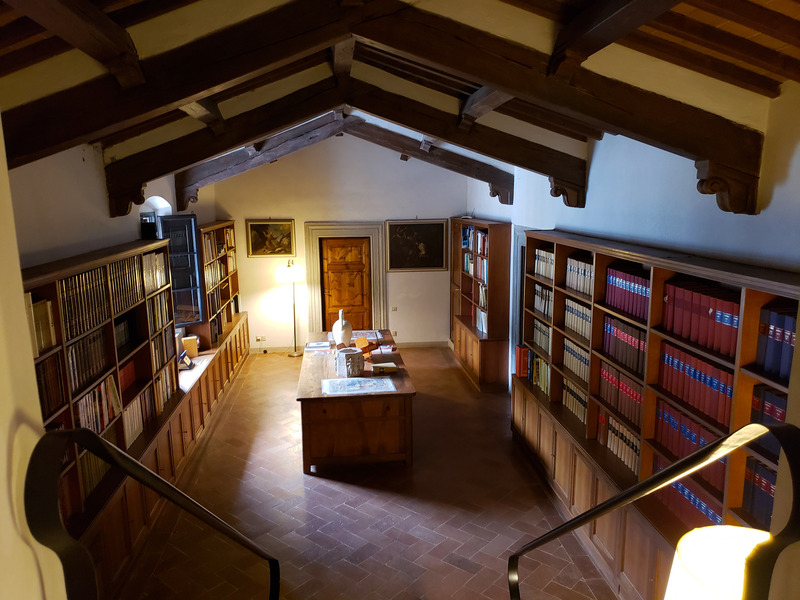 our room entrance is in a library! love this bed and the stool!! 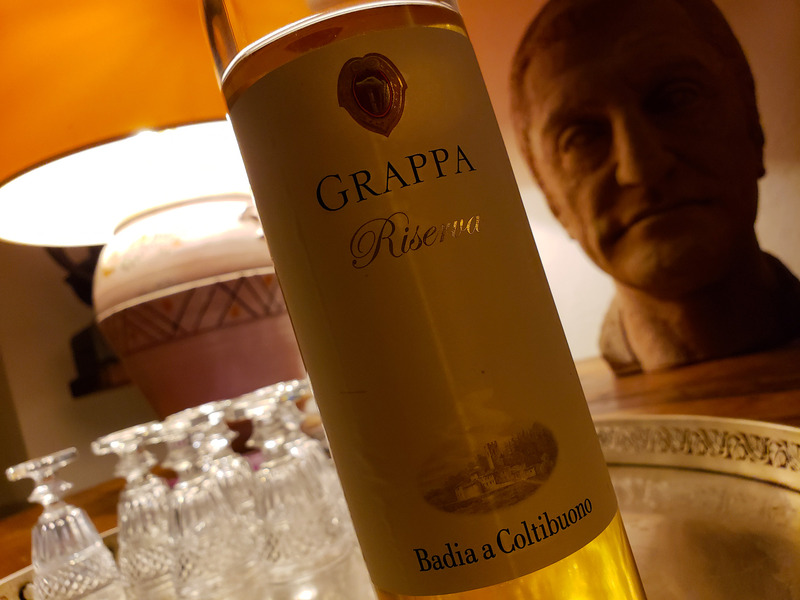 They had free grappa in the lounge. I wish we could have stayed one more day so I could take a cooking class from this amazing lady in this gorgeous kitchen! the best farm cheese ever! 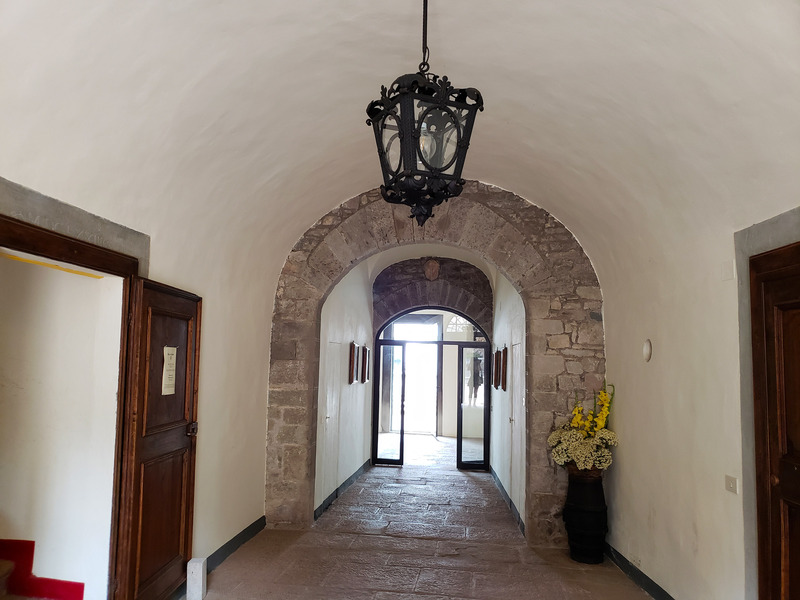 A few steps away from our room was the entrance to the gardens which, as we learned, were restored according to the monks’ original designs (aside from the swimming pool area – I am pretty sure that pool supplies were hard to come by in 1,100s, haha). 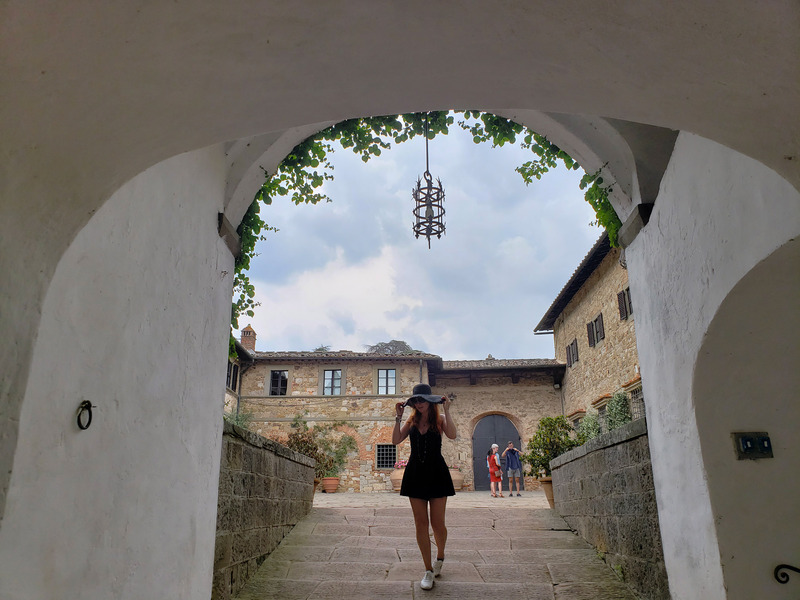 We walked the tranquil garden paths, watched the butterflies and the bees and imagined the monks walking and meditating, centuries and centuries ago. 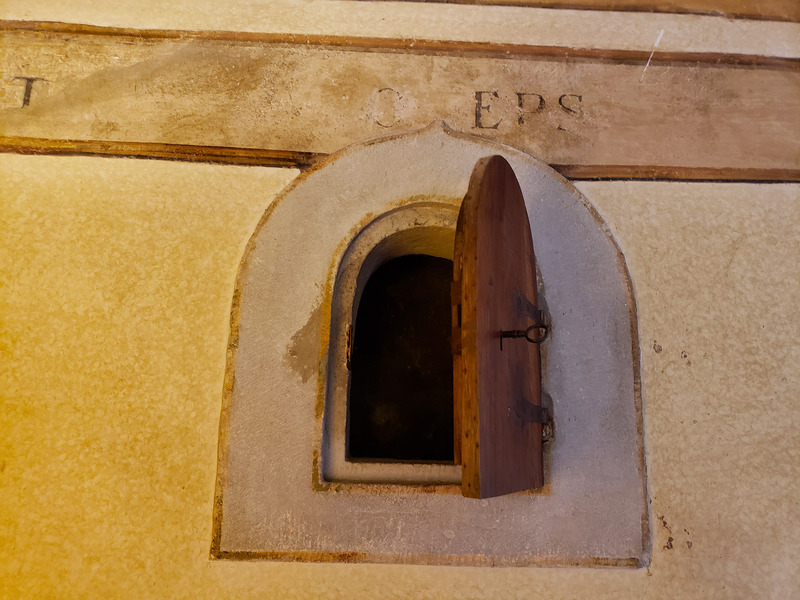 Badia a Coltibuono is one of the oldest and most famous wine producers in the Chianti Classico region of Tuscany. 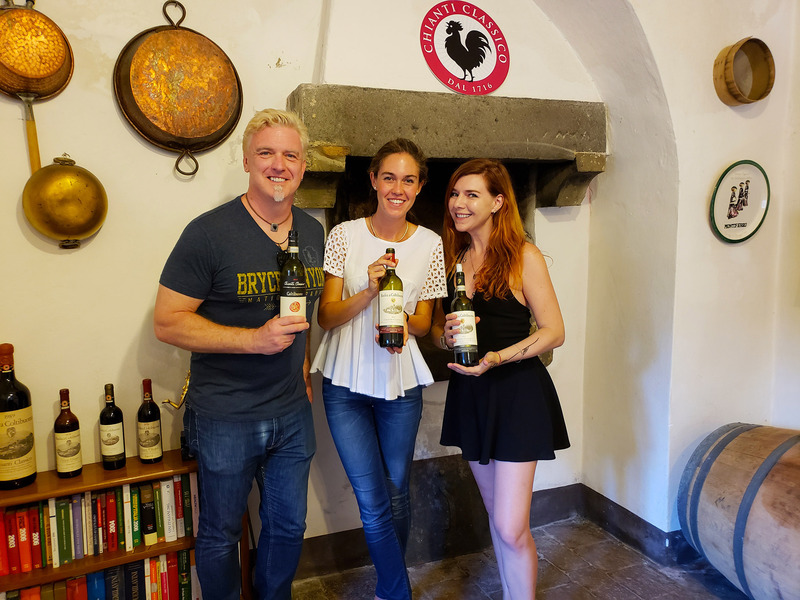 Their wine is 100 percent Sangiovese, the signature red grape of Chianti and Tuscany. Nick and I took an hour long guided tour (our guide Giulia was awesome!) 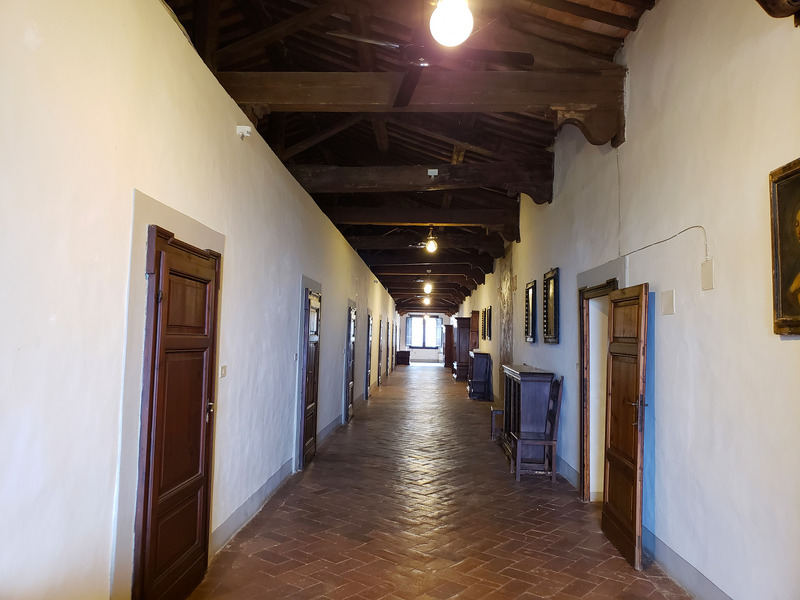 which included the history of the abbey, the grounds, the wine and a visit to the cellars (which originally were built as the crypts (and are supposedly haunted!)). 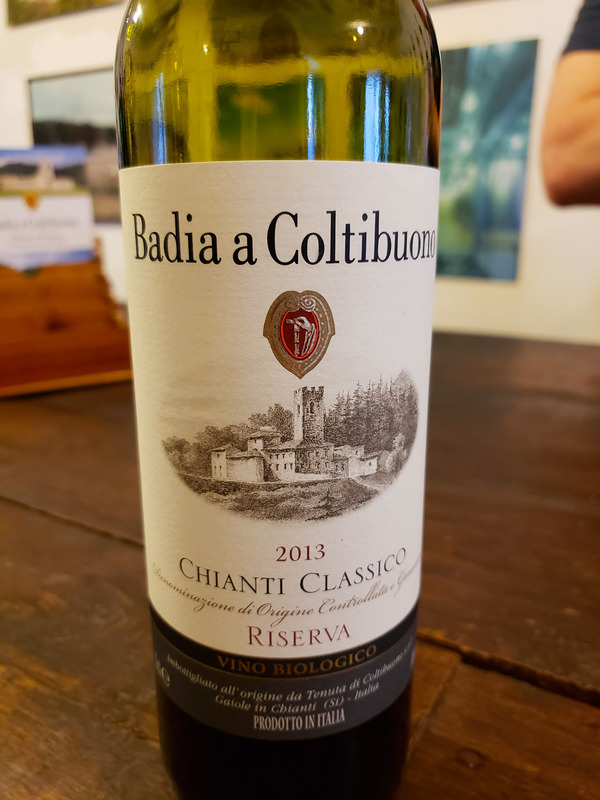 At the end of the tour we tasted 4 wines that Badia a Coltibuono produces. 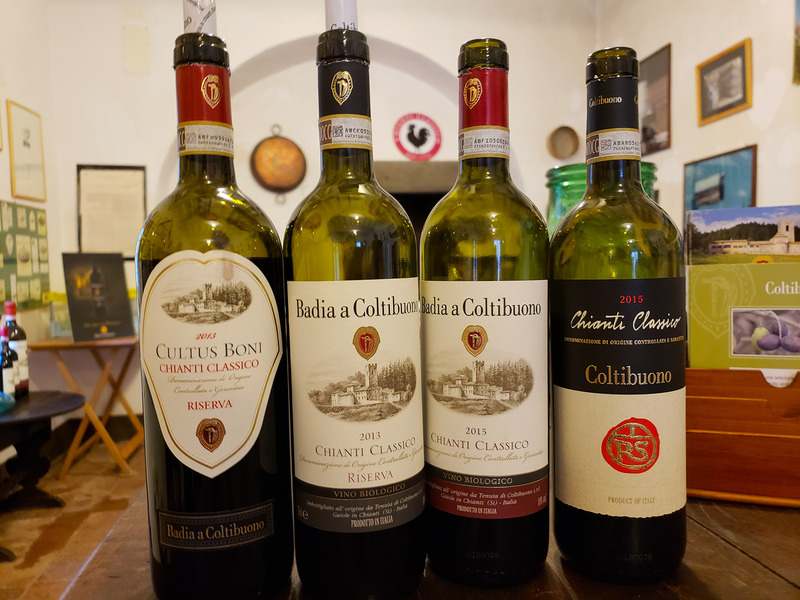 One of these wines (Badia’s 2013 Chianti Classico Riserva) was one of the best we’ve had in all of Italy! Click on the first photo and then next. I captioned a few of them. they make their own olive oil too! 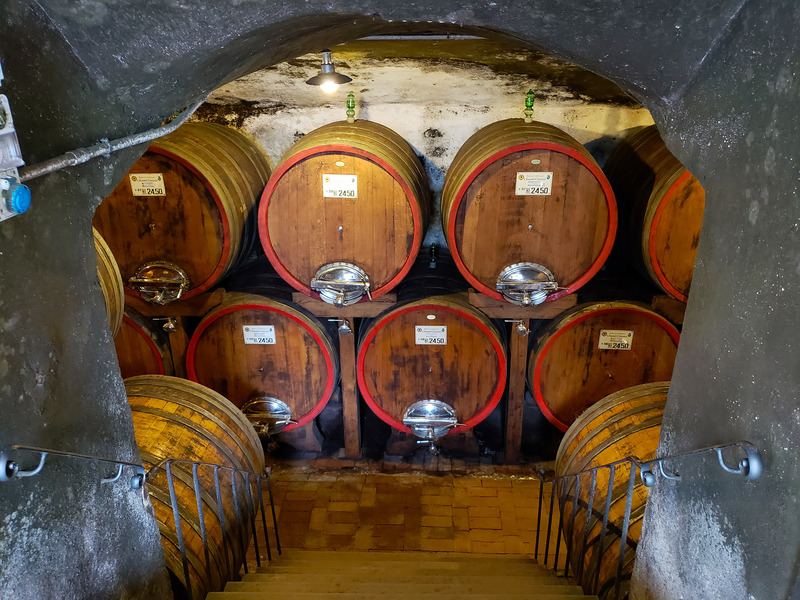 some of the wines in the private collection are 100 years old! 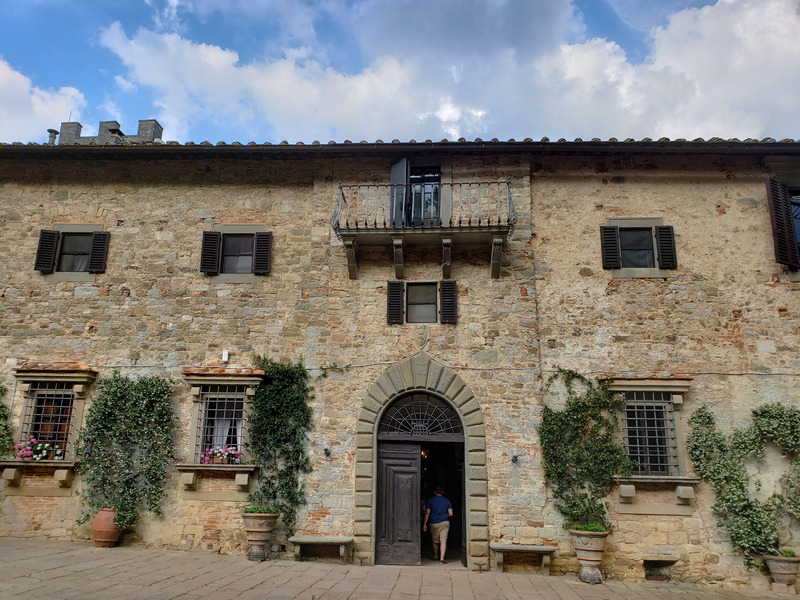 A short walk from the abbey is the Badia a Coltibuono’s fabulous farm-to-table restaurant. Both the food and the views exceeded my expectations. Set in the refurbished stables, the restaurant makes everything from scratch. Its produce comes mostly from the property’s gardens. There was house-made bread, pasta, and olive oil (soooo good!) but the biggest surprise for me was venison tartare (locally hunted). It was divine! 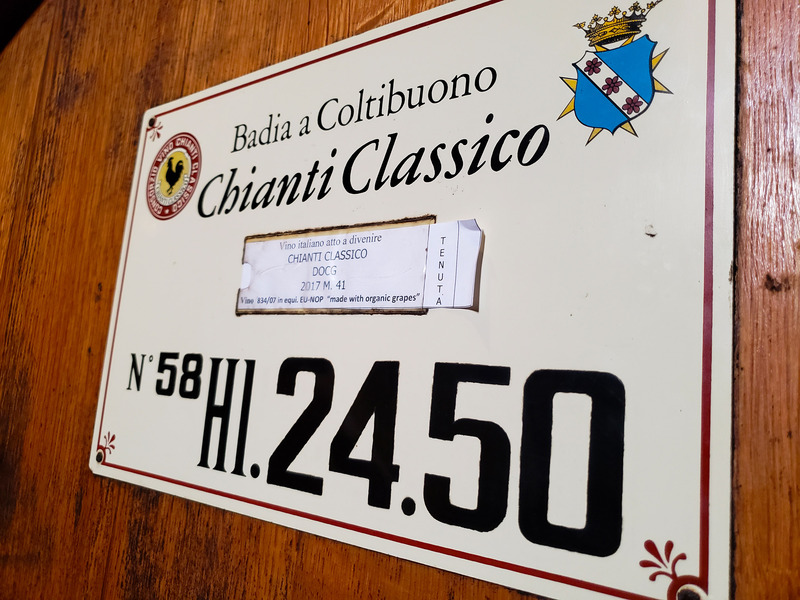 And, as I mentioned earlier, the Badia 2013 Chianti Classico Riserva was my favorite wine in all of Tuscany (we did quite a lot of wine tasting in Tuscany). The views were magical (see the photos and my captions below). An evening Nick & I will never forget. I love this water bottle!! 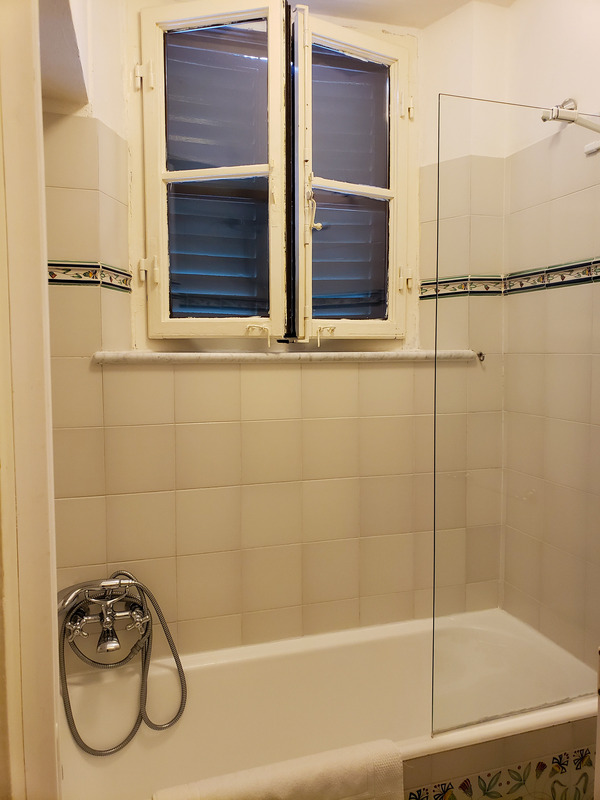 the water in Tuscany tastes great, by the way! these guys were the nicest!! you can’t see the view behind us, but it’s beautiful!! 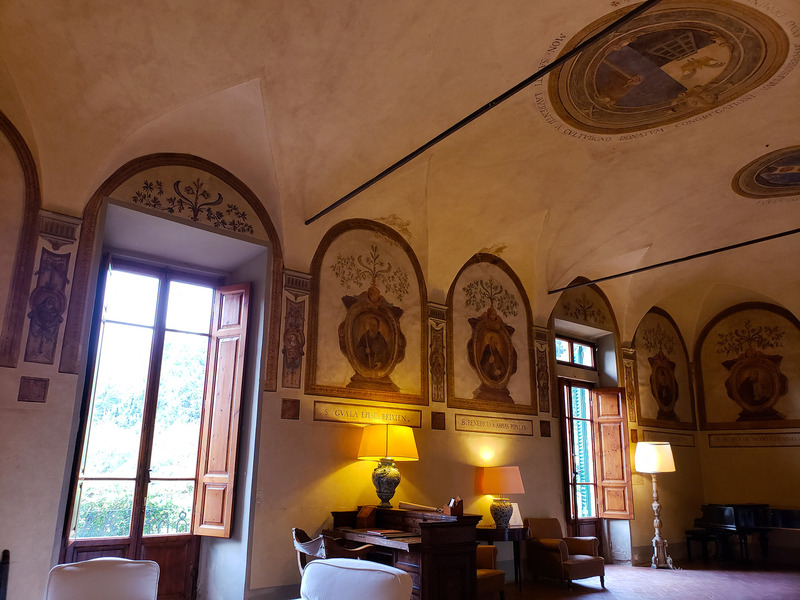 Our stay at Badia a Coltibuono was complimentary. All views and photos are my own. I stand by every word – as always! Next Oktoberfest in Los Angeles: My Favorite German Restaurant Discovery (Wirtshaus)! I notice there is something missing in these photos. People. Tons of people. And to me, that’s what makes this all look especially appealing. You have discovered yet another oasis of beauty and charm far away from the crowds. There is much to see in the big cities and I would never want to miss out on all that. But your travel blogs are really opening up a new world for me to explore. Looks like it takes a little effort in the planning and preparation department in addition to the willingness to wander off the beaten path, but WOW, it looks like its totally worth it. Are these places really as uncrowded as your photos suggest? I would love to escape the crowds. Love, love, love your photos and your stories. Thank you for sharing with all of us. With all the negativity in the world, you once again offer joy and beauty. Hi Barry, wow, thank you soooooooooooo much for your amazing words!!! 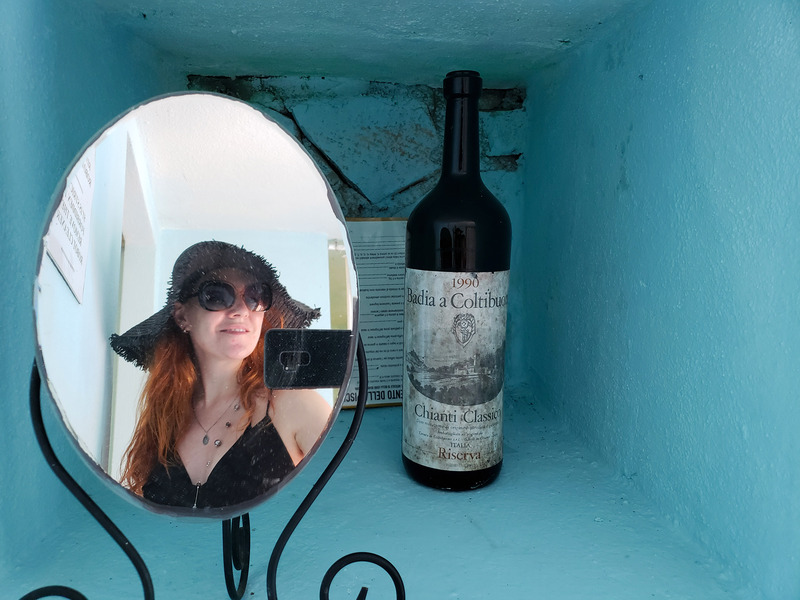 Yes, as I often mention, I love to travel to places off the beaten path. This place was one of these magical places. The only people we saw were at breakfast or in the restaurant, and then a couple of people exploring the gardens. That’s it!! It really felt like we had this place all to ourselves!! It made me SO HAPPY to read your words. THANK YOU. Hi Marina, this place looks amazing! 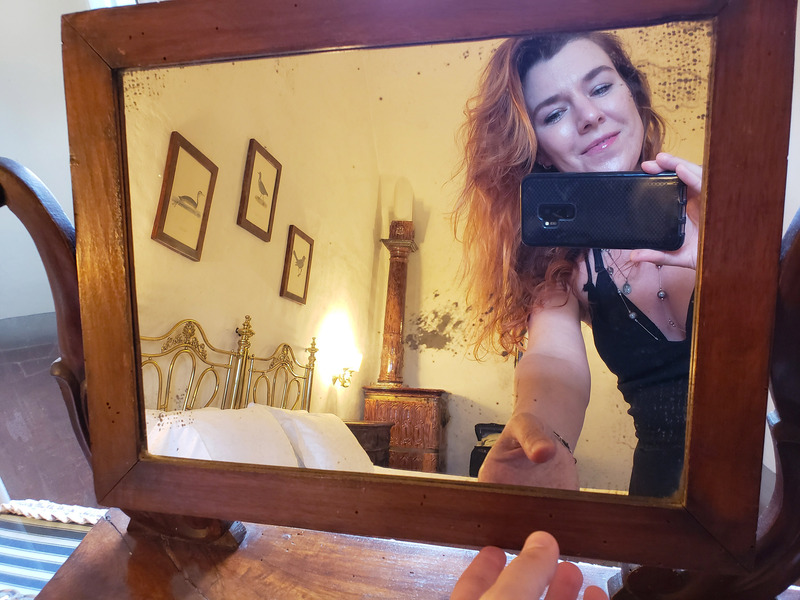 A trip to Italy is in the works for 2019, I am making note of all of the amazing places you’re writing about. I’ve never stayed at a place like this.